Daily Illuminator: Munchkin Shakespeare Kickstarter Launches Tomorrow! February 6, 2017: Munchkin Shakespeare Kickstarter Launches Tomorrow! Would a munchkin by any other name be just as sweet? 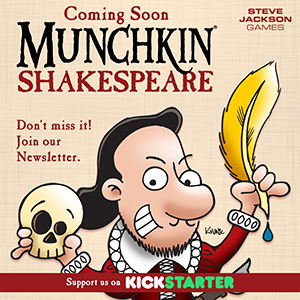 It will be, when Munchkin Shakespeare launches tomorrow! Our newest version of Munchkin is hitting Kickstarter tomorrow morning, and we're excited to give the bard the spotlight, center stage. This new game starts small and will have an optional Kickstarter-exclusive expansion available, but we hope to be able to increase the card count and fun options as the campaign goes on. Stay tuned for more details on that. You can learn more about why we chose Kickstarter to make this game by reading Munchkin Czar Andrew Hackard's article from Friday. Make sure you sign up for our newsletter so you are alerted to our launch before it happens. (You can also follow us on Kickstarter!) And you will want to know when we launch because, let's just say, the early patrons to our little theater will get a bit of a bonus. We'll have much more to show you once the project launches tomorrow, February 7! You should follow us (and John Kovalic, too) on social media for bonus content we'll be releasing throughout the campaign. See you on stage!